In the past, I’ve written about my personal experience with Ehlers-Danlos Syndrome (EDS), a condition that is associated with loose, hypermobile joints that have a greater-than-normal range and degree of movement. People with Ehlers-Danlos Syndrome can dislocate their joints easily and joint pains are very common. For many years my yoga practice always ended with severe pain in my joints and limbs, and blood clots in several areas. Fortunately, after several years of practice and with a lot of modifications, my asana practice has now metamorphosed into a stage where the focus is to achieve a higher state of positive experience, contentment, and a sense of accomplishment. Instead of going deeply into a pose right away or twisting recklessly, my goal is to strengthen all my vulnerable joints. In the process, I am limiting the depth of the range of movement. At the same time, I have experienced far less pain. Despite all these precautions, I continue to experience periodic episodes of widespread pain in the joints and limbs. A couple of years ago, I was in the middle of my yoga practice with my left knee bent and the heel snugged into my left groin, right leg wide apart, bending deeply down over my right leg in Parivrtta Janu Sirsasana (Revolved Head-of-the-Knee Pose) when I heard it—a popping sound in my right lower back. I untwisted my torso and, without coming to upright, swept it midway between the legs and gradually lifted myself to an upright position. As I came up, I noticed a dull ache over my sacrum, but I ignored it. As days passed and my yoga practice continued, I realized that the dull ache intensified and I experienced pain that radiated out from the hip socket and all the way down the outside of the right leg. The pain was excruciating in twists and forward bends. Finally, I consulted my physician who in turn referred me to an orthopedist. After a thorough physical examination and a demonstration of the pose at his request, he diagnosed my pain as being caused by inflammation of the sacroiliac joint (SI joint). He explained that the cardinal symptom of SI pain is an ache on or around the posterior superior iliac spine (PSIS), on one side of the body only (in my case it was the right side). 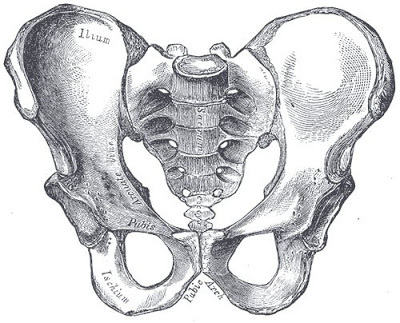 The posterior superior iliac spine is the rear-most point of bone on the pelvis. It is easy to palpate it by pressing your fingers into the back of your pelvis above the main mass of the buttock, about two or three inches to the side of the center line of the upper sacrum. You will feel a distinct, bony prominence beneath your fingers. If a student tells you that spot or the depression just to the inside of it is achy or tender, while the corresponding spot on the other side of her body is not tender, then the student is probably experiencing an SI problem. However, my orthopedist clearly stated his inability to objectively measure the degree to which the SI joint was “out.” He suggested I take corticosteroids to bring down the pain and inflammation. I am not a “pill” person and resolved to use the same environment where the SI misalignment occurred—my mat and my yoga practice—to help strengthen the joint, sacrum, and hip. To do that, I first had to educate myself on the sacroiliac joint. The two SI joints are weight-bearing joints that distribute weight from the spine to the lower extremities (legs) through the hip joints. The SI joint is formed by two bones: the sacrum and the ilium. The SI joint has only a small amount of movement. Its major function is stability. This is needed to transfer the downward weight of standing and walking via the lower extremities. Held together by strong yet pliable anterior sacroiliac ligaments, the SI joint is designed to lock in place in standing positions with the sacrum bone wedging itself into the pelvic joint due to the weight of the trunk. This compact sacrum-pelvis connection, together with the psoas and illiacus muscles, creates a firm base for the entire spinal column. However unless you sit with your sacrum angling forward at about 30 degrees, this stability is lost because the sacrum is no longer wedged into the pelvis. The SI joint pain is a result of stress at the joint created by moving the pelvis and the sacrum in opposite directions. This can be caused by an accident or a sudden movement, as well as poor standing, sitting, and sleeping habits. In yoga asanas, inflammation and/or pain mainly arises due to the unusual and consistent stresses experienced by the supporting ligaments and muscles around the SI joint. This is especially true in asanas that move the pelvis and sacrum in opposite directions (twists or forward bends with legs wide apart as in Parivrtta Janu Sirsasana or Upavista Konasana (Wide-Angle Seated Forward Bend). After knowing more about the importance of the SI joint, I returned to my yoga practice with caution. The SI joint remains healthier if it is not stretched too much. In fact, focusing on creating stability is the key to preventing SI joint overstretching and thus remaining pain-free. I focused on strengthening the muscles around the SI joint by practicing simple backbends and standing poses. I began to take particular care with my pelvic alignment in twists and forward bends. I had aggravated the sacroiliac pain in large part by the way I was practicing seated twists and seated forward bends. While I was meticulously keeping my pelvis firmly on the floor during twists and seated forward bends, I allowed my spine to twist strongly in one direction, while my pelvis strained and stayed behind. While every pose needs an anchor, in twisting poses the anchor is not the pelvis; instead, it’s the thigh and the foot that is on the floor. The most important thing to remember about the SI joint is that it is a joint of stability and not mobility. In seated forward bending poses, such as Janu Sirsasana (Head-of-the-Knee Pose), Baddha Konasana (Bound Angle Pose), and Upavista Konasana, just sitting with your pelvis tilting back “unlocks” the sacrum and the ilium. If additional stress is then placed on the joint, discomfort and/or injury could occur. In seated poses like Janu Sirsasana, I started practicing by placing the foot of the bent knee touching the opposite knee instead of the inner thigh to reduce the torque of my sacrum and ilium. To reduce the stress that the weight of the thighs places on the SI joint in seated poses, I started placing a firm, rolled blanket under my outer thighs especially in Baddha Konasana and Upavistha Konasana. Since bending forward from a seated position can add to the destabilization of the SI joint, I started bringing my legs closer together than usual and resting my arms and forehead on a block or a rolled blanket positioned between my legs. To prevent excessive stretching of the ligaments, I held these poses for short periods. I also took extra care not to push down on my knees or place extra weight on them in order to increase the stretch. I focused on strengthening the SI joint area by doing simple backbends, such as Dhanurasana (Bow Pose), in which the pelvis moves forward and contracts the posterior muscles. This helps move the sacroiliac into place and also strengthens the muscles of the lower back and hip. I focused on standing poses as they help strengthen the area around the sacroiliac joint. Warrior poses, Trikonasana (Triangle Pose) (photo right) and Utthita Parsvakonasana (Extended Side Angle Pose) strengthen the iliopsoas and gluteal muscles that help to stabilize the area of the SI joint. In asanas, never create a torque of the sacrum and ilium moving separately. Understanding the importance of keeping the sacrum and pelvis together in twisting and sitting movements is the key to remaining pain-free. Healing the sacroiliac joint requires the practitioner to be mindful of all movements. The goal is to safely advance the strength and function of the SI joint. Ram Rao, Ph.D. With a doctorate in Neuroscience, Ram presently serves as a Research Associate Professor at the Buck Institute for Research on Aging. He focuses on various aspects of age-associated neurodegenerative diseases with emphasis on Alzheimer’s disease. In addition, Ram completed the academic training at the California College of Ayurveda (CCA) and received his certification as Clinical Ayurvedic Specialist. 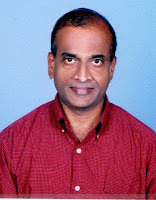 He has been a faculty of the California College of Ayurveda and teaches in their Nevada City location. Ram is also a dedicated Hatha yoga practitioner and is a Registered Yoga Teacher from Yoga Alliance USA. In his spare time, he offers consultations in YAMP techniques (Yoga, Ayurveda, Meditation & Pranayama). Ram has published several articles in major Yoga/Ayurveda magazines and has been a featured speaker in several national and international meetings and symposia. He is a member of the National Ayurvedic Medical Association (NAMA) and is on the Research Board of the Association of Ayurvedic Professionals of North America (AAPNA).